"Products Created Directly from the Creation of NMRA National Award Winning Dioramas by Richard E. (Ben) Bendever"
Each of our Doctor Ben's Weathering Solutions Sets, Weathering Stain Sets, and Weathering Pigment Sets are accompanied by one of our corresponding "How-To" booklets (all three shown at the left). These laser printed, eight-page, four-color booklet have the very same information that we demonstrate at all the hobby shows we attend every year as well as available on our website Blog (Blog Archive, June 2015). 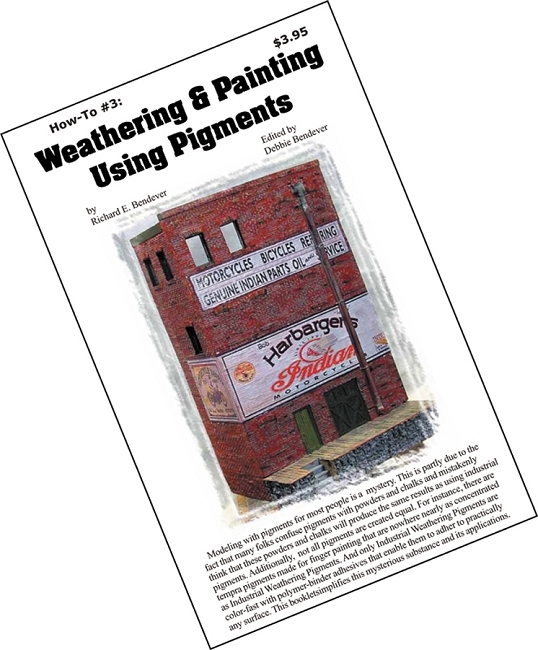 And, if you purchase booklet before purchasing the corresponding Weathering Set, you will receive a $3.99 website Credit towards your next Weathering Set purchase! So What's our "How-To" booklets all about? 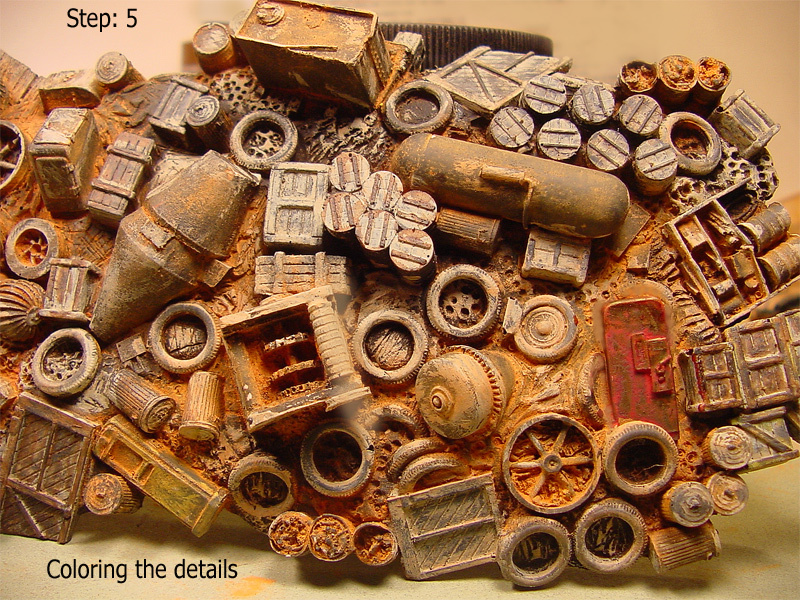 At left is an image from the Realistic Weathering Solutions technique in our "How-To #1" booklet. The Realistic Weathering Solutions are ready-to-use with no preparation necessary and all that is required is an ordinary hobby brush and your active imagination. Of course, if you can't imagine what a weathering boxcar looks like, do like me. I take a daily drive to the Post Office and invariably I always get stuck waiting for the train to pass. 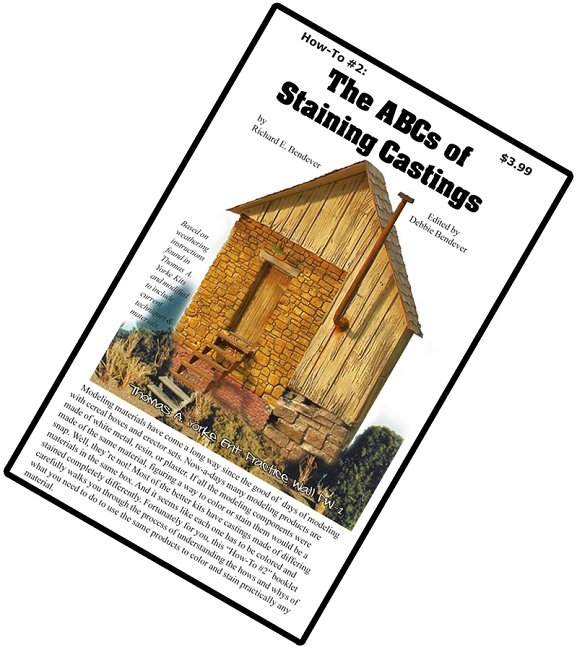 So I finally got clever and remembered to bring a camera..
At left is an image from The ABCs of Stain Castings in our "How-To #2" booklet. Although directed towards Hydrocal & LabStone castings, this booklet provide information to apply stains to resin and metal castings, too! Whether you are a novice or a professional, this booklet series is for you. Each year we attend numerous hobby shows and we have some basic techniques that we share with our visitors where folks can take our products home and begin using them just like at the show-no experience necessary! 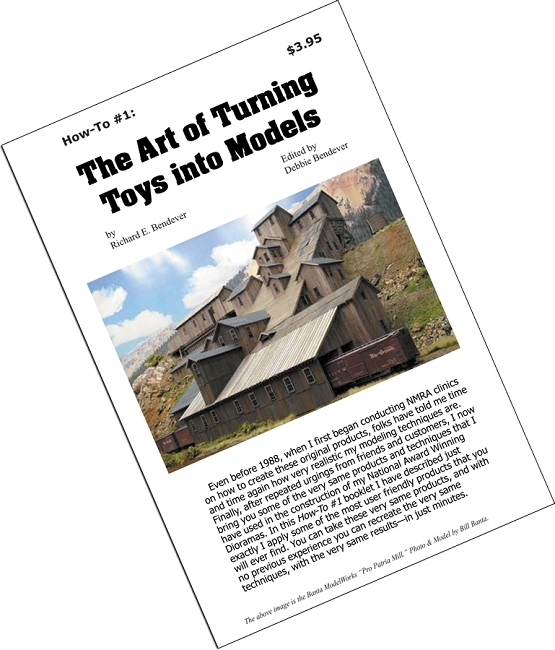 If you want your models to look as bad as ours do, you need to use what we use. 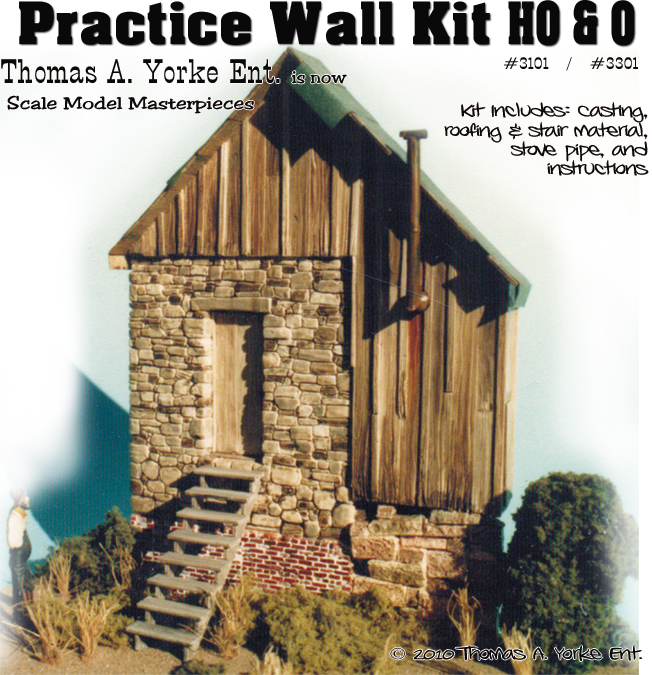 This How-To booklet is included *FREE* in the Doctor Ben's Weathering Stain Sets #1 & #2 AND in each Thomas A. Yorke "Practice Wall HO/O scales. You will find all of these mentioned products and many other great Doctor Ben's products in our store! 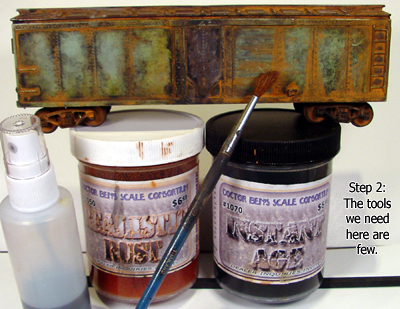 At left is an image from the Using Industrial Weathering Pigments technique in our "How-To #1" booklet. I get more questions about how I created the weathering in this image than most any other image. Honestly, it is VERY easy. I start out by painting the castings (metal, wood, resin, it doesn't matter) a flat black or black primer. I then wash the entire surface with our Doctor Ben's Aged Driftwood (a replacement for Floquil Driftwood) and after the Aged Driftwood dries, I use Sharpie markers to color in the details (be sure to use permanent markers-anything else will fade over time). I then use the Doctor Ben's Micro Blaster with Instant Age and spray the entire surface. When this is about dry, I come back with our Doctor Ben's Industrial Weathering Pigments and brush on Rust, and Dust and Soot and whatever else is open. That's it, I promise!! This booklet also includes painting brick & stone with pigments. You have never read anything like this. 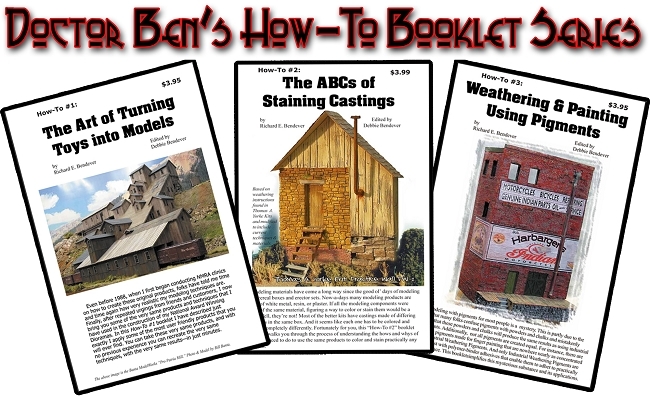 These How-To booklets are included *FREE* in all thirteen (13) Doctor Ben's Weathering Sets! But, you would like more information? Not a problem; simple got to the bottom of the page and CLICK on the "Blog" link and go to the right column: Archives: June 2015 to view all three (3) booklet in the on-line format. Or, just CLICK HERE! The on-line booklets are identical to the paper version only without the paper. have Fun! Copyright © DEBENLLC. All rights reserved.